Yesterday, I tweeted this about some resources that I’ve been working on for the Language paper. I wasn’t sure how to share them as the originals have questions from the secure site on AQA on them. So, I’ve taken the questions off for the shared versions as I don’t want to share when I shouldn’t but left the findings about those questions on the bottom of the chart. Give the students the vocabulary and get them to complete as many examples as they can and then get them to feedback first as a class, so that I can address any misconceptions. Then, give them the self assessment sheet to check against/add to their own ideas. Next, I will give them the Language paper tasks and ask them to complete each of the suggested activities in turn, so that they have worked with all the questions from the previous exams multiple times and are completely 100% familiar with them. Then, I will use the questions as quick starters to recap the questions between now and the exams. As I said above, the idea behind these resources came as a result of the mock exams and identifying what next. Hopefully, these will be useful and will help make sure my students are completely familiar with the different questions as well as the vocabulary in the exams. I’ve explained previously that our cohort of Year 10 sit the exam in May and that this works really well for them and our context. I inherited this system and have been really pleased with how this works in terms of teaching and for the students too. However, it does mean that we have to start the expectation of revision from day one of year 10 with real rigour. All documents mentioned in this blog are attached at the bottom of the page. This is where our home learning policy which I wrote about previously works really well: Why I love… Homework and strongly believe in it (or home learning!). We interleave home learning every week and this gives students a chance to consolidate, independently apply knowledge and focus on writing extended pieces, all skills which will benefit them in the exam at the end of the year. The students in year 10 have rose to the challenge and the home learning books are extremely useful revision tools for them. We have encouraged them to use these to reflect over Easter. Obviously, we also want to gain parental buy in to the revision process as well and in order to do this, we have sent home our PowerPoint on “How to revise” and have sent letters explaining what revision looks like and what our expectations are over the holidays. See attached below. We have also been contacting home regularly for students to praise their efforts in class and in home learning and to express any concerns and hopefully this approach means parents are aware of exactly how their child is progressing in English this year. Before Easter every student in Year 10 was given a revision reminder. The reminder was in the form of the “How to revise” power point and with teachers going through the expectations of the home learning for Easter. We tailored the booklet to specific classes as we had taught different Shakespeare texts and different 19th Century texts (although always paired). We have also sent the power point to every student in Year 10, so that they can refer back to it. The Easter booklet has a practice essay for every component of the exam in it and then a range of activities for them to use to help them revise – see below. So, each student has (over Easter) the opportunity to write and reflect on their ability to complete an essay for: Shakespeare, 19th Century texts, modern fiction, the Anthology and Unseen single and comparisons, as well as specific revision tasks that they can tailor to their needs. Furthermore, we recognised we had not covered Unseen comparison poetry essays in any detail so we took the whole year group during extended registration between myself @katiesuther and @megan_dunsby and delivered a lesson to the whole year group to go over how to approach this (the lesson was created by another colleague Elisa and worked beautifully with examples showing a really low mark answer and a full mark answer which showed exactly what to do to obtain marks.) Thanks to Katie for recognising this and getting it organised for us. When we return to school after Easter we will be focusing on only revising the content and skills for the exam as every class has finished the content. We started the year with Shakespeare, moved onto Animal Farm, then onto A Christmas Carol or The Sign of Four and throughout the year we have interleaved the 15 Anthology poems and Unseen Poetry, which means that we have covered all the content and can focus solely on revision that we want our particular classes to do. Importantly, we have not offered any revision sessions over the Easter holidays as it is the students responsibility now to ensure that they are ready to sit their exams and we will, of course, help and support them with guidance, but offering Easter revision isn’t something that we wanted to do. Hopefully, they have everything they need and know where to look and what to do. In today’s Literature session during tutor time for 25 minutes today, we focused on The Anthology – Power and Conflict. We were also thinking about how to make sure we were answering the question accurately and how to ensure we were selecting a good poem to compare, as well as thinking about some top tips for the comparisons. As I said in the last post on these sessions:Why I love…Interventions for Literature – Aiming for 5+ the group is from different classes and that means that they will most likely have completed different texts for Shakespeare and 19th Century choices, so in order to make the lessons as productive and useful as possible I’ll be sticking to texts that cross over. This means that we’ll cover: Animal Farm, The Anthology and Unseen Poems. Then, having discussed what ‘reality of war’ was – the actual physical and emotional truth of being either in a war zone or a soldier experiencing a war zone, we made a list of comparative poems. and to justify their choice of comparative poem. As they did this I looked at the choices they were making and probed their reasoning, as I wanted them to think of three ways they would compare them. They gave feedback on the differing reasons for choosing each poem. Then, we went through some top tips, discussing these as a class. Write an intro using the same structure as last week. Intro: Use “Both poems + name of poems + focus of question.” Then, explain the three ways the key focus is shown E.g. Exposure vs Bayonet Charge = “We” vs “I” is different so the viewpoint or the speaker, weather (pathetic fallacy) creates reality and the reality of suffering. The point of focusing on the intro again was to reinforce how to drive forward an argument using strong ideas from the start of the essay and to use these three key ideas as the structure of the overall argument. Also, the students were being prompted throughout the session to explain and justify their choices and start to think about how they could revise for The Anthology part of the exam. In Exposure the pathetic fallacy is obvious throughout and shows that war is real and painful, not just because of the gunfire and pressure of fighting for survival but as “the iced winds knive us” suggests they are being stabbed painfully but the cold. However, in Bayonet Charge the fast movement of the soldier means he is hot and sweaty and doesn’t have the same focus on the weather as Exposure, which means that the poets are reflecting on this differently. Perhaps, Owen is reminding us that the weather was a brutal, long drawn out and silent killer unlike the fast paced action in Bayonet Charge where he is charging towards enemy lines in a more stereotypical way. where I deliberately didn’t use a quote for the second poem to try to show them that it is possible to be analytical even if your mind goes blank in the exam and you can’t remember a quote. In the final few minutes I went through the attached Pictionary game with them and got them to recall the poems, using the slides with the four quotes and pictures. They were pretty good at this and I reminded them that these are really useful visuals to help them learn some key quotes too. This is not my work and all credit needs to go to my brilliant colleagues @megan_dunsby who introduced the department to this strategy and @katiesuther who also developed and used this, sharing it with us. Also, to both for discussing how and why it works and helping us all to embed this with our students in our teaching and putting together the resources that are attached. Through modelling explicitly with the students what they need to do and how to do it, as well as getting them to practice the steps initially using the “I” then “You”. We tend to miss out the “We” step for co-constructing responses as we always work on the same topic as a class, so to make it vastly different from the teacher model to the whole class construct and then their own, might be a bit of a stretch. However, using the I – then You model has worked really well. This scaffolding was then taken away and it becomes a step by step guide to writing as effective viewpoint piece. Then, finally we have encouraged them to take the phrases that they have learnt in the stepped approach and make them their own or adapt and develop them beyond the examples that we have given them. The scaffolded sentence openers have encouraged them to extend their paragraphs beyond one or two sentences. It has forced them to consider what three different issues or main ideas they could include in their viewpoint writing. It encourages a wide range of punctuation. The sentence stems have sophisticated vocabulary in them. The sentence stems can be adapted and shaped to suit the tone or style of the writing (once they are confident with them). Students have responded with sophisticated use of statistics and worst case scenarios as a result, as well as including anecdotes. The overall shape and structure of their content is much more sophisticated and varied. Due to the consistent approach to using these steps. We have consistently used these scaffolds and started to take them away, but it has also created some interesting next steps and we have discussed the following issues in the department and completed feedback and next steps with the classes. “Displeasing reality” just means think of a worst case example and discuss this. The language used in step five has proved problematic for some students, but we can and will adapt this and have explained what it means. Internalise this dialogue – What do I think? Why do I think this? How do they feel? Why do they feel like this? What can be done about this? Where has this been resolved? When does action need to be taken? Global problem – change to bigger problem if the idea of a gloabl issue doesn’t translate to what you want to or need to say. Bring the argument back to the statement every paragraph or otherwise your viewpoint isn’t tightly focused. 3 – Government organisations need to get involved – police/NHS/Members of Parliament etc. Why would I recommend it as an approach? It has undoubtedly helped the students feel more confident in presenting their viewpoint in a way that is focused, structured and developed and I’ve seen a real increase in the quality of work as a result. As I said at the outset, this is not my work and I’m not taking credit for it, but hopefully sharing it is useful. Write a letter to your local MP expressing your viewpoint on this topic. Recently, it has come to my attention that children under the age of 18 may be given a criminal record if they steal, which is clearly unfair, unjust and unreasonable. Think about it, would you like to have a criminal record, because you did something silly and society was sending a ‘strong’ message’? Of course not: criminal records should not be given to under 18s, criminal records should be reserved for serious crimes and children should be treated differently to adults as they are not fully culpable. A recent report states that 95% of police officers think that criminalising children for petty theft is ridiculous. If this 95% of police is ignored – police will be forced to arrest young people knowing that they will become criminals. Furthermore, children’s brain development is not complete before they are eighteen years old, therefore they should be treated with some leniency. From personal experience, I understand that some young people can be reckless, my own brother was caught shoplifting as a teenager and was absolutely mortified as a result. My parents grounded him and took all freedom from him as a result of his awful, immoral behaviour. Sanity must prevail then, no person under the age of eighteen should be given a criminal record, instead we need school, parents and police to work together to provide education that stops this type of misdemeanour before it happens. There would be outrage if their precious children were arrested and treated the same as violent offenders, therefore education will help to avoid this terrible affliction on our young people. Ultimately, we must consider contacting parents before their children become criminals. In time this will not only be a national concern but a global problem too as often other countries follow the laws, rules and regulations of the United Kingdom. I urge you to stop this law in the House of Commons as otherwise we will be endangering the youth of today. If you don’t stop this terrible law your political party will benefit for years to come as young people as young people will vote for you and you will show the world that you are sensible. Undeniably, this action will lead to a reduction in young people being punished in an extreme way, which threatens to ruin their future and hopefully lead to more personal responsibility. Action must be taken. Once again, I would ask you to consider whether you would like to have a criminal record, because you did something silly and society was sending a ‘strong’ message’? Surely, you know it is time to acknowledge the truth and admit that this law is unfair, unjust and would be detrimental to the next generation of young people, who are already living in a world where there are issues and problems. Recently, it has come to my attention that children under the age of 18 may be given a criminal record if they steal, which is clearly unfair, unjust and unreasonable. Please consider this, would you like to have a criminal record, because you did something silly at a young, impressionable age and society was sending a ‘strong’ message’ by criminalising you for the rest of your life? How preposterous: criminal records should not be given to under 18s, ever; criminal records should be reserved for serious crimes, as otherwise we are creating a nanny state; finally, children should be treated differently to adults as they are not fully culpable, meaning that we need to be compassionate not punitive. Government think tanks even agree: statistics released suggest that 95% of police officers think that criminalising children for petty theft is ridiculous, harmful and will destabilise the justice system. If this statistic is ignored – police will be forced to arrest young people knowing that they will become criminals. This should not be an option for our children, in our developed world and in our country where we can help educate, inform and train young people to take moral responsibility for their actions and deter them from stealing in the first place. Furthermore, children’s brain development is not complete before they are eighteen years old, therefore they deserve wholeheartedly to be treated with leniency. Leniency does not mean that there should be no consequences, leniency is the humane and just way forward in this situation. How did our country get to the point where this issue is being seriously debated in Parliament? From personal experience, I understand that some young people can be reckless, my own brother was caught shoplifting as a teenager and was absolutely mortified as a result, being caught once was enough to prevent him from following this path of self-destruction. However, that was as a result of the parental involvement: my parents grounded him and took all freedom from him as a result of his awful, immoral behaviour and this home sanction was enough to stop him from going even further down a path of self-destruction. Sanity must prevail then, no person under the age of eighteen should be given a criminal record, instead we need school, parents and police to work together to provide education that stops this type of misdemeanour before it happens. There would be outrage if their precious children were arrested and treated the same as violent offenders, therefore education will help to avoid this terrible affliction on our young people. If funding was offered to support programmes of intervention in schools and with parents, then no child need ever face the possibility of having a criminal record for life as a result of a preventable action. Ultimately, we must consider contacting parents before their children become criminals. In time this will not only be a national concern but a global problem too as often other countries follow the laws, rules and regulations of the United Kingdom. Parents all want their children to be healthy, happy and useful citizens and therefore would immediately surge forward to ensure they can stop this law. I urge you to stop this law in the House of Commons by blocking the motion and encouraging your fellow members of parliament to also follow suit, as otherwise we will be endangering the youth of today’s future. If you don’t stop this terrible law your political party will benefit for years to come as young people will vote for you and you will show the world that you are sensible. Undeniably, this action will lead to a reduction in young people being punished in an extreme way, which threatens to ruin their future and hopefully lead to more personal responsibility. The youth of today’s future lies in your hands and I seriously doubt that you want to fuel further the mental health crisis that is gripping the young people of our nation at the moment! Stopping this bill will absolutely help reduce the mental health crisis from gaining any more momentum, which would in turn cost the state a horrendous amount of money. Action must be taken. It must be taken now. Once again, I ask you to consider whether you would like to have a criminal record, because you did something silly and society was sending a ‘strong’ message’? Surely, you know it is time to acknowledge the truth and admit that this law is unfair, unjust and would be detrimental to the next generation of young people, who are already living in a world where there are multiple issues and problems that are causing stress, anxiety and fear in unparralled ways. Stop this bill now for the sanity of our youth. Yesterday, after school, I had my usual little revision session and the year 10 students in the group have a mock exam on the Anthology coming up. They wanted to know how to revise effectively and how to structure the essay. This was when a message from Philly about something else reminded me that I could use the @FlipsCoCards (they can be found here: https://flipscocards.com) from work to aid me – the bonus being limited prep time and instant access to excellent information about all the poems. So, armed with the cards we got started. I’m not gaining anything by saying they are brilliant and I plan to use them in my targeted revision with my classes after Easter too. We filtered through the cards, discounting the poems that had not been studied, used the index of comparison on the back of the title card to decide which theme to focus on. We chose “reality of war” and the essay topic was born from the cards. Then, I discussed what the essay structure should look like. I went through the two line sentence introduction that I have been using with them previously as a reminder and explained how to adapt this to make sure that they were including information about both poets and both poems. The picture below shows what we talked through and what they wrote down in reference to the structure of the essay – this is shared with permission from the students. Next, we talked about what a comparison looked like and how to structure the main body of the paragraphs. We briefly discussed the conclusion and this is something that we will return to when we have more time. We had already filtered the poems to Bayonet Charge and Exposure so we placed those cards in front of use and I wrote the question they were going to tackle down and annotated it with them, talking about what they needed to be thinking about and the three ideas that they could include in their own introductions. Then, we wrote. They wrote their introductions and I live checked and fed back on them asking them to add to or adapt them to make them clearer and then they used the @FlipsCoCards to refer to the meaning, quotes and details from the poems. Having the cards in front of them for this process was unanimously decided by the students to be a really useful process and they wanted to take them away with them, but as they are school copies I couldn’t let them. I’ve sent the link to the website to their parents though and hopefully they’ll order some for them. I marked and discussed what they had done and asked them to finish them for homework for me as the writing of the whole essay will help them in advance of their mock exams. Both poems Exposure by Owen and Bayonet Charge by Hughes are similar in their negativity towards war. They reflect on the reality of war by offering vivid imagery relating to soldiers in conflict, use time and weather as motifs to show suffering and explore a sense of fear to reflect on the bleak reality of war for soldiers. Exposure and Bayonet Charge use vivid imagery when they reflect on how brutal war catually is. For example; personification of the weather in “merciless east iced winds that knive us” suggests the impact of the terrible conditions on the men is like being stabbed, which is a horrific reality in war. Men on the front line were not only being subjected to barrages from enemy artillery fire but also weather is being shows as the enemy too. This seems ironic and unjust as these men are already living in the trenches in inhumane conditions. However, the vivid imagery in Bayonet Charge is dis-similar in many ways as it is shown through the plethora of verbs used “Suddenly he awoke and was running” showing the soldier either in fear of his life awakening from an actual real slumber or due to the enemy fire metaphorically he has awoken to the reality of his situation and realises he is running towards danger, instead of away from it, which is anti-human nature. The fight or flight response in his body would have been charging through him and further verbs “stumbling” and “rolling” are used to reflect how vivid the actions are that take place and also directly contrast the silence and oppression that takes place in Exposure. The connective in “But nothing happens” reinforces this terrible waiting game and again vivid imagery is shown through the inaction versus the action in both poems. Hughes poem, while set directly on the battlefield, is his imagining what it would be like, whereas Owen actually physically experienced the horrific, tragic reality of war, Hughes in contrast was safe and reflecting on stories he heard from family as a young boy. Perhaps, this makes it more engaging that Hughes captures the sheer panic of a “Bayonet Charge” so vividly, while Owen shows the harsh truth of was as a waiting game between battles, something he was very aware of due to his experience as a soldier. Further to this grim depiction using imagery, time and weather are recurring motifs in both poems. Pathetic Fallacy and personification is used in “mad gusts tugging on the wire” to imply that the wind is blowing furiously and is really angry, increasing the sympathy for the men in the trenches as we know the barbed wire is the “wire” referenced by Owen as a deliberate marker of where they are. Furthermore, connotations of “mad” are insanity, craziness and being on the edge and the wind appears to be in a fury, which could link to the madness that infected many soldiers during and after the war. The madness I refer to is what we now understand to be Post traumatic Stress disorder, but which at the time of the war was widely misunderstood. Men suffered extreme trauma and the “mad” winds that are reflected in the negativity of the “misery of dawn” which is often a time of peacefulness and joy but here is juxtaposed with “misery” suggests that nothing is positive or hopeful. “Rain soaks” and “clouds sag stormy” and “shivering ranks of grey” are all depictions which effectively reinforce the suffering of the men as once they are wet, they have nowhere to get dry: the noun “Rain” effectively demonstrates this. This weather is a repeated motif in Exposure and Bayonet Charge doesn’t use the horror of the weather in this way, but does use time as a motif instead, the metaphoric questioning in “what cold clockwork of the stars and nations Was he the hand pointing that second?” almost shows that the soldier believes his fate has brought him here but that this doesn’t seem right or okay. It is almost as if he was in the wrong time at the wrong place, which although depicted differently in Exposure is a similar feeling that is expressed. Both soldiers in Bayonet Charge and Exposure, seem to recognise that humanity has failed in their duty and that fate has caused them to suffer in the extreme during the war. Hughes expresses this failure in the first-person perspective from one soldier view, while Owen seems to reflect collectively on the experience of war. Perhaps, Owen’s depiction of the collective suffering of men is more realistic due to the vast swathes of men that died in the war and the fact that they couldn’t get away from each other in the trenches, they were tightly packed with other men and the rats that lived in there too. Again, the reality of war is presented through horrific imagery in both poems but the poets elicit sympathy for the men in different ways. The fast-paced moment in time action in Bayonet Charge versus the never ending cold endured in Exposure. Finally, a sense of fear is evident in both poems which reflects the reality of war as men would have been terrified, but in a very British manner, this was not talked about when they came home. Instead men often had a stiff upper lip attitude towards what they had experienced. The fear is evident in the listing of how the soldiers are reacting “silence, sentries whisper, curious, nervous,” with the caesura reflecting how cautious they are being but also how much they want to speculate on what is going to happen next. They are clearly waiting in the “misery of dawn” for the next enemy attack and the silence is juxtaposed with the “dull rumour of some other war” that they can hear in the distance. This must have been thoroughly un-nerving and nerve-wracking for the men as all they can do is wait for the next piece of enemy action, while being aware that this is happening near them. In Bayonet Charge, the fear is shown in the faltering of the soldier who is under fire and inadequately out in the open with his “bayonet” which is a small knife attached to the end of the gun, more suited to close combat than running in the open towards the enemy. The simile “his foot hung like Statuary in mid-stride.” Depicts his pause and how this saved his life as the “yellow hare” was shot at and killed rather than him. This moment of stillness in an otherwise action packed narrative from the soldiers perspective helps to create the sense of fear the soldier must have had. Both Exposure and Bayonet Charge have clear evidence of a sense of fear throughout and the most poignant reflection in Bayonet Charge is the listing of “King, honour, human, dignity, etcetera Dropped like luxuries” show the loss of hope and faith that the soldier has while in the thick of battle and shows that the idealism and patriotism with which soldiers went to war was no longer important as the fear during the action had managed to make these ideal superfluous. This poignancy is also reflected in the loss of hope and faith in Exposure which is extremely similar “For love of God seems dying” showing with the modality that the soldiers want to retain hope but it is becoming more and more unlikely. In this way both reflect a sense of fear as without hope it there anything worth living for? Clearly, Hughes and Owen had different experiences of war and Owen’s real-life experience can account for the sense of hopelessness and grim reality of the war that is depicted in Exposure. Even the title reflects how out in the open and exposed the soldiers were, while Hughes shows a deep understanding of the personal effect on the physical and mental health of a soldier in war, perhaps gleaned from his relatives. The tile Bayonet Charge reflects the active depiction of the soldier running towards the enemy line with no apparent care for his safety. Both Exposure and Bayonet Charge are warnings against the folly of mankind going to war as the reality is never glamourous, never humane and never worth the casualties and it is perhaps this message that future generations need to take heed of. Although, we only used the Anthology in this session, we will use the Shakespeare Macbeth and ACC in subsequent sessions. This week, for the first time, ever – I taught Tissue. Now, I have been dreading it, because it doesn’t seem clear cut or obvious. As I told my class – it is definitely ambiguous (and then I proceeded to explain ambiguous). I started with them folding a piece of paper and making it strong and unbreakable – an idea that was not my own, but was given to me by @katiesuther in the office when we were discussing the poem as a team. Then, I held up (a clean) tissue and asked them to think of the connotations of it. They were able to come up with excellent ideas and then I asked them “What other kind of tissue is there?” and “think Science” which resulted in a great deal of connotations and human biology links. Then, we opened the Anthology and explored the title by annotating it with the ideas we’d already constructed through discussion. After this, we read the poem as a class and discussed four key ideas along with annotating the poem under the visualiser with the information that they were coming up with. Then, explored the bigger question – If we don’t record what we have done does this mean it didn’t happen and that we didn’t exist, which led to some lively debate. Finally, we explored how paper was an extended metaphor for the frailty of human existence and that Dharker may have been commenting on this need to document life rather than live it and that we only have one life, so should live it well. Once, we’d done this and annotated thoroughly we read together Sarah Barker’s excellent blog on the subject and I got the students to go back over the poem and explore where light references were made (as Sarah suggests) and we discussed the ideas in her blog. That was all we had time for, but from a poem I was dreading teaching to reflecting that it wasn’t as bad as I initially thought. Which I hope Sarah doesn’t mind me linking to here. Explore how a conflict in identity is explored in Tissue and one other poem from The Anthology. Dharker and Rumens explore conflict in identity in contrasting ways in Tissue and The Emigree. In some ways, it could be easier to reflect on this identity conflict in The Emigree as it paints a picture of displacement, loss and reflection on a loss of origin, while Tissue is less tangibly conflicting in the presentation of identity conflict. However, Tissue shows the conflict of identity in the way humanity and paper are inter-twined, how identity seems to be constantly questioned and in the way the poem leaves a question in the mind of the reader about whether we record things on paper to prove our existence or whether being here in life is enough. The sense of displacement is reflected in both The Emigree and Tissue however in the way borders are drawn and closed. Rumens uses the first person “I left it as a child” to explain how her country of origin was a memory to her now. The conflict of identity is reflected when she repeats the modality of “it may be at war, it may be sick with tyrants” to show that she understands that what she remembers is not the reality of now in the present and although she is left “with an impression of sunlight” this is not the truth of the life in her country of origin in the present. Identity here is very much tied together with memory and the conflict is evident in the sense of familiarity with a place, despite not having been there for a long time. In Tissue, we have a different more familiar conflict of identity with the use of the noun “Maps too.” And the end stopping making them seem final and permanent. “Maps” may not immediately create a sense of conflict over identity but they have been symbols of mankind and humanity over the years dividing up territory and putting up invisible barriers and creating conflict over land between people for many many centuries and this is where the identity conflict could lie. The use of light imagery in Tissue is reminiscent of light imagery in The Emigree “sun shines through” and “sunlight clear” with both poets reflecting on the power of light to create a feeling of familiarity. Tissue reinforces the invisible boundary and the conflict between national identity that can arise when borders shift and change on paper as a result of conflict or civil unrest. The listing in “the borderlines, the marks that rivers make, roads…” suggests that these are constructed on paper by mankind to leave a mark, but that humans themselves are fallible and will not be a permanent mark on the planet. This suggests that the human feeling of displacement in The Emigree is as a result of belonging to a group based on national identity, whereas identity conflict in Tissue is much wider and the poet seems to suggest that we are living on borrowed time but leave a legacy to be remembered behind through the paper constructs that we create. Both poets reflect on the conflicts, engendered by humans that result in feelings of displacement and loss. Loss is another way in which both poems are different. Loss in The Emigree is much more tangible as the persona says “I have no passport, there’s no way back at all” which has a bittersweet tone and a sense of melancholy as they can’t return home. While in Tissue “who died where and how” is recorded which creates a sense that loss is a larger part of life and that if we have been written down in life, then we will be remembered after death, so loss is more accepted in Tissue, than in The Emigree. While loss is more accepted, the conflict in identity in Tissue appears to stem from the question if you weren’t written down, do you exist? While in The Emigree this loss is the loss of a way in to a place that the persona feels they belong to, so both losses are intangible and can’t be described completely accurately. Loss is shown in The Emigree through the way the persona reflects on her childhood memories and seems to be unable to get past the inability to go back and to belong “close like waves” is an effective simile to show that she is shut off as a result of the conflict in her home country. However, in Tissue the loss is metaphorical and wistful in “might fly our lives like paper kites” with this simile implying that our lives will easily blow away in the wind and be meaningless. This identity conflict is less obvious in Tissue as the ephemeral nature of life seems to be more evident in Tissue, than in The Emigree. The final reflection in both poems is the way rules and regulations are put in place by humanity and this seems to be a similarity in both the poems as “raise a structure never meant to last” appears to be a metaphor for life being limited to a certain amount of time and no matter what you do this is a fact that you as a human can’t change. Furthermore, humanity is shown to be totalitarian in “banned by the state” showing that these are impositions placed by people that stop individuals feeling a part of the state. The conflict in identity here is through the man-made regulations that both poems reflect on. It seems that both poets explore conflict related to identity with a focus on humanity. Tissue takes a long term, century wide approach, while The Emigree is an individual perspective that looks at one persona’s experience of identity and what it means to them. In this way conflict in identity is shown in both as personal and relatable and as something that is wider than the personal and more reflective of the ephemeral nature of life. Over the past week, my class have prepped and written essays using the topic “Fear of Death” for A Christmas Carol. When I first thought about the question, it seemed innocuous enough, after all it fits beautifully with the dramatic irony that is inherent throughout Stave 4, but then I got to thinking – is is innocuous and turns out it’s actually far more tricky and convoluted than it first appears. Yes, it was brilliant for exploring the wider themes in Chapter 4, but much more difficult to apply to the whole novella focus. With this in mind, I asked students to annotate the extract for quotes that showed a clear fear of death and we discussed at length how Chapter 4 was in itself clearly focused on Scrooge’s fear of death and his inability to look under the shroud or recognise that the deathly visits he was party to were actually all about his own imminent death. Students were really clear about how a fear of death was shown in stave four. That was the first part of the planning. Next was the trickier part. I wanted them to come up with whole class fear of death examples but to do this I asked the to take a two fold approach. I asked them to draw a simple two collumn table and to split it into staves and exemplify any signs of fear of death and how you could disagree that a fear of death was shown. This was fruitful as it showed them they could look for the contrasting argument and just because a fear of death was clearly evident in Stave 4, this didn’t mean that the rest of the novella would be as clear cut. We did some feedback and discussion and agreed that the evidence was scant elsewhere that Scrooge was scared of death, but that the hints and glimmers or foreshadowing of his later abject horror were evident in the novella as a whole. As I’ve said before my class is mixed ability and I have students who need scafffolds and students who can write at such a high standard. So, I did a close exercise introduction on the board and asked them to use their ideas from across the novella in this and did a close exercise paragraph 1 getting started. The class worked on this for an hour in total and then I completed a whole class feedback sheet. There were some effect and +why? missing, but on the whole they had done the topic real justice. However, context was the key ingredient that was still missing, so next lesson we went through the examples from this blog: Why I love…Embedding Context with specific links to A Christmas Carol and they were able to identify how the context was embedded with the examples and which context was used. We did a low stakes retrieval practice quiz to end and to start we had mind mapped the context that they could remember. Next steps, is a new essay which will be non supported bar the success criteria and the question. Before that though, for the highest level students, who are working desperately hard at gaining the skills and knowledge for a grade 9, I will be sharing the example essay below and asking them to explore why it is a high level essay and steal phrases or ideas that they can use. A copy of the essay and the extract with the fear of death question are posted below. How does Dickens suggest Scrooge deserves redemption in ACC? and I will use an extract from Stave 5 to support this. Explore how Dickens presents a ‘fear of death’ in the novella A Christmas Carol? Dickens only shows a real fear of death in the character of Scrooge in Stave Four when the Ghost of yet to come shows him his own death. However, earlier in the novella there are glimmers that he is fearful of death when we see Marley’s Ghost for the first time (although this is quickly rejected by Scrooge), when Tiny Tim is on the brink of death there is some compassion and humanity shown although this is a minor fear of death in the wider presentation of Scrooge as a character who is miserable, uncharitable and unkind to humanity in general (eventually he does have an epiphany and is able to change). 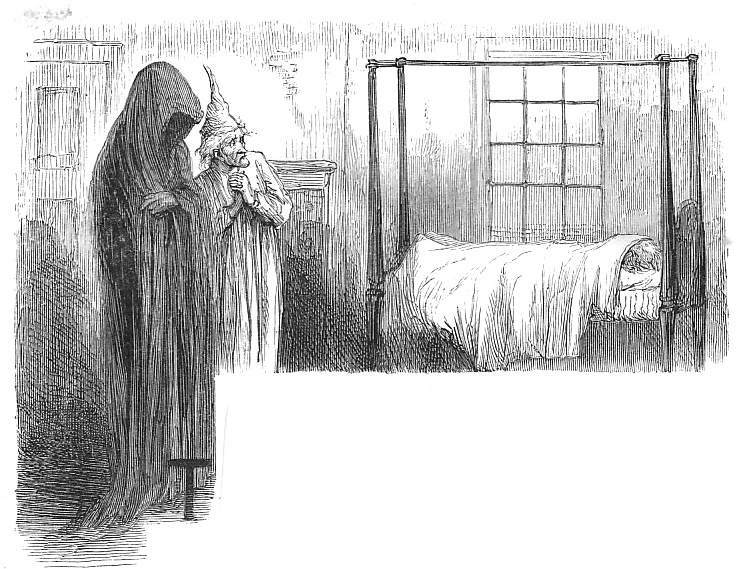 When Dickens introduces the theme of death and Marley’s ghost in the novella through the first line “Marley was dead: to begin with.” the foreshadowing is evident to the reader, who would have been aware of the ghost story conventions, and it suggests that death is not something to be feared as it is an everyday occurrence and everyone lives and then dies. By setting the novella up through the theme of death it appears that Dickens is commenting on the fleeting nature of life and perhaps the idea that you need to be a good person in life and that is more important than wealth or possessions. However, Scrooge is introduced to us and we see his desire for wealth, his avarice and his unpleasant demeanour and instantly dislike him. He appears at this point to fear nothing, enjoy nothing and speaks unpleasantly to all around him “Are there no workhouses? Are there no prisons?” is his resoundingly unsympathetic response to the “two portly gentlemen” with the rhetorical questions supporting the uncaring and non-Christian response that Scrooge has towards them. In constructing Scrooge in this way and showing him not only reject Christian do-gooders but also his own nephew Fred, we are inclined to see Scrooge as a stereotypical outcast and Dickens seems to emphasise all the unpleasant traits of humanity through Dickens. It is also clear that he feels no fear of death or remorse that his partner has been dead “seven years” and that he chooses not to care if he is called “scrooge or Marley – it is all the same to him” showing that he doesn’t even attempt to re-name the business out of respect for the dead. This rejection of behaviour that is ethical shows a lack of fear towards the dead and a lack of superstitious response on his part. As well as this, when Marley appears in the door knocker, Scrooge immediately rejects the idea that he can be there, rejecting the common notion of the time that spirits can come and haunt you. However, we do see some stirring of emotion and fear when Scrooge retires to his rooms as the repetition of “looks under” is used to show that he is checking for the ghost that he thought he saw in the door knocker. This suggests a glimmer of fear on Scrooge’s part, but this is quickly ignored as he settles to his gruel. Finally, in Stave 1 Scrooge at the end shows another slight human response to death and a fear of it when he hears the “moaning noises” and see the other spirits wandering in purgatory. At this stage of the novella, Scrooge seems intimidated by the experience he had with Marley, but not entirely convinced that it was real. Furthermore, the fact he “immediately went to sleep” creates an impression that this first supernatural experience, for Scrooge was not wholly upsetting. Dickens use of purgatory is interesting as we know this is a waiting place between heaven and hell and we know the symbolical reference is that Scrooge needs to change his ways, however the dramatic irony evident here is that Scrooge is completely unaware and his fear of death is not as this point particularly strong. This means that the other ghosts have to work hard to show Scrooge that he should fear death or he too will be metaphorically “wear (ing) the chains he forged in life” like Marley and as a punishment for his wrongdoing, avarice and unkindness. The first Ghost appears and shows Scrooge his past. There is a slight flicker or kindling of recognition that losing someone you love “she died a woman” is said mournfully about his sister “Little Fan” which is ironic as the Ghost is presented as a candle in order to metaphorically and symbolically light up the past for Scrooge to see where he went wrong and show him how he could be different now. This flicker of fear is momentary though and quickly forgotten by Scrooge. The next tiny moment of realisation of the human impact of death is in the Present, when the ghost takes him to the measly Christmas dinner of the Cratchit family which highlights several unfortunate truths: their abject poverty is caused by Scrooge’s poor pay, the working conditions for Bob make his family incredibly unhappy, the children have to work to help the family survive and Tiny Tim is disabled possibly with rickets and has to use a crutch, as the family have not got enough money to pay for him to see a doctor. The stark truth is shown to Scrooge in relation to the life of Tiny Tim when a “ghostly crutch” sits in the corner and Scrooge directly asks the Ghost “Tell me, will Tiny Tim live?” with this question showing that he has some humanity and fears death on behalf of the Cratchit’s, something that has up till now not been a consideration of his. However, this small indication of fear shows that Scrooge is beginning to change and to become a better person, someone who considers others feelings. At this point in the novella the allegorical meaning is clear as Scrooge can see the poverty the family live in and he can also feel the guilt and blame for this as he knows that he is culpable. This fear of death shows a different side to Scrooge and the Ghost spirits him away to show him more examples of dire poverty and the unfailingly positive side of human nature as everywhere they visit people are cheerful, interested and focused on enjoying time together, unlike Scrooge who has rejected mankind and shown no remorse for his selfishness. He was “solitary as an oyster” initially because he liked his own company and counting his money and failed to recognise, like Marley that “mankind was my business” which is something that this slight fear of death and the supernatural journey he is undergoing is beginning to teach him. Dickens message is again clear about the way you behave towards other people being more important than material possessions. Finally, in the extract in Chapter 4, it is evident that the most horrific fear of death is shown through the metaphorical presentation by Dickens of the Ghost of yet to come as a grim reaper figure, the ultimate portrayal of death and one that Scrooge states “I fear you most” and “I’m prepared to bear your company” with the first person pronouns suggesting that Scrooge is ready to take responsibility for his past and listen carefully to the lessons that the future will bring. Ironically, Scrooge is ready to listen but the ghost is mute with a “pointing finger” reinforcing the idea that Scrooge is correct to be fearful of death as death will be silent, painful and take him to places he doesn’t wish to visit. The verb “recoiled in terror” shows that Scrooge is no longer marginally fearful of death but in fact terrified. He sees the shroud and takes a step back showing his inability to process what he is seeing. Connotations of “terror” are abject fear, distress and horror and this is the first time we have seen such strong emotions from Scrooge. While, Scrooge shows his fear of death properly for the first time properly, Dickens reinforces this in the gothic description of the animals trying to get into the room of death “a cat was tearing” and “gnawing rats” use the verbs to describe how the animals try to get in which is creepy and terrifying. Furthermore, “Scrooge did not dare to think” implies he doesn’t want to confront the harsh reality linked to death – decaying bodies, being left to picked at by animals and exploring how death is so powerful he dare not even imagine it Is happening to him or his body. At this point the dramatic irony increases the tension as we know Scrooge has been rendered powerless by death and he isn’t even aware that it is his own death (although you could argue that subliminally he does and he just isn’t ready through his fear to admit it). When Scrooge reflects “I have not the power” to the ghost he is admitting his shortfall and the repetition of this dialogue shows that he is finally ready to see the error of his ways and shows that he has recognised that death is unpleasant, unnecessary for him and that he is fearful of it as he is not ready to give up on life. In fact, he is ready to change and this is evident in the way he whole heartedly uses the mantra “I will live in the past, the present and the future” at the end of Stave four and then repeats at the beginning of Stave 5 to show that he has recognised he fears death, wants to live and will be a better man, directly as a result of the interventions of all the ghosts. It appears evident that Dickens is telling his allegorical tale in an engaging and entertaining way, using the supernatural and ghostly spiritual events to show that we need to be better people in life or the afterlife will be an unpleasant place for us. Scrooge learnt his lesson and became “second father” to Tiny Tim, which is heart-warming as Tim was one of the first characters we see Scrooge warming to and showing proper emotion towards. The fear of death is underplayed throughout the novella until Stave four and then shown to the reader in a way that is not subtle, leaves no doubt that Scrooge must change or die and that reinforces the whole message of striving to be kind in order to avoid being alone, miserable and lonely. Dickens does this by bringing the worst character traits to life initially in Scrooge, showing him have an epiphany when he fears death the most and then showing that no matter how awful and tyrannical you are, you are worthy of redemption. This Christian message is heart felt in the final stave of the novella and reinforced by Tiny Tim’s last words “God bless you everyone”.